On a slightly drab but mild October morning, I set off early to go to the Level in Brighton and meet supporters from across Brighton and Hove at a rally to promote public services today, Saturday, 13 October. It was organised by Sussex Defend the NHS and Brighton and Hove Trades Council. Before formal proceedings kicked off, I met Beverley Berstow who is standing as the Women’s Equality Party next year in Hanover in the local elections. Ms Berstow explained her party’s vision to me in this way: “We don’t really want to exist as a party but none of the other parties are doing anything for women’s rights. I don’t think they are taking them seriously.” She said many members of other parties including men as well as women came to the Women’s Equality Party because of disaffection with mainstream politics. Beverley Berstow with her colleagues. Valerie Mainstone who works at the Brighton Unemployed Centre among other places across the city said we should challenge the government’s hostile environment wherever we can. She said: “I saw the valuable contribution made by the immigrants to the NHS ever since 1948, when African-Caribbean nurses first appeared in hospitals. “My great-grandmother died for want of a sixpence before the NHS because no doctor would come unless you could pay. Maud from Migrant English Project and Brighton Migrant Solidarity took to the podium to talk about immigration and, in particular, unfair detention. She said the UK has the largest number of detainees in Europe, although the number of children in detention has dropped from 109 in 2009 to 42 this year. She criticised the government for putting structures in place that means people from outside Britain pay a healthcare tariff which is 50% higher than the tariff the government pays for British nationals. Matthew Webb, a member of Brighton and Hove Trades Council which is a branch of the TUC, said: “The misfortune of sickness should not become a burden of poverty and indignity.” He said trade unions supported the victims of Grenfell and the Schools SOS as well as the NHS, migrants and young workers at Wetherspoons. “We’re here because we’re angry. Angry that this government continues to break up and marketise our NHS. “Angry that Brexit will make this even worse – putting off EU workers who no longer feel welcome here. Freedom of movement is a precious gift – the right to work and study and live and love in 27 other countries – we should be defending it, not trashing it. “Angry that health workers have to rely on handouts and foodbanks. And that’s why our message is loud and clear – invest in public services and Stop the Cuts. “The Prime Minister had the gall to stand up at her party conference and to expect our gratitude for declaring that austerity is over. The truth is that austerity was never needed. It had nothing to do with the financial crisis and everything to do with an ideological obsession with shrinking the state. “And the damage that has been done to our hospitals and schools is immense. Ambulances backed up outside A&E departments. One of my 84 constituents left alone on her bathroom floor for over four hours waiting for an ambulance. And when it comes to our schools, per pupil funding slashed. “It’s wrong that head teachers are forced to sack teaching assistants, to end support to pupils with mental health problems, that parents are having to organise jumble sales for basics like books. “So what can we hope for from his replacement (Jeremy Hunt’s) at the Department for Health, Matt Hancock? Well, don’t hold your breath. “This is the Health Minister who has received £32,000 in donations from the Institute of Economic Affairs – an organisation which describes the NHS as one of the most, “over-valued, inefficient systems in the world. “A Health Minister who’s been actively endorsing the GP at Hand app operated by the private company Babylon, and requiring patients to deregister from their existing practice before they can sign up. “With a tally of 10 GP practices having closed in our city in the last few years alone… (he should) start investing properly in our national health service. “Friends, we know things could and should be different. And we know that by coming together we can make them different. No patients waiting hours on a trolley in A&E. No patients suffering in pain, as operations are repeatedly cancelled. No more running down and dismantling our NHS. No more slashing funds for our schools and our welfare state. “I’m proud to be standing up in Parliament to fight for our public services. I’m proud that the Green Party has championed the NHS Reinstatement Bill from the very beginning. Peter Kyle, MP for Hove and Portslade, has signed the TUC’s ‘Dying to Work’ charter this week, to support and protect any of his employees who become terminally ill. The Dying to Work campaign was set up by the TUC following the case of Jacci Woodcook, a 58-year-old sales manager from Derbyshire, who was forced out of her job after being diagnosed with terminal breast cancer. The campaign is calling for a change in the law to prevent the same thing happening to other working people. Hove MP Peter Kyle said: “Workers should be able to expect support at an incredibly distressing time, and I am proud to have signed the TUC’s ‘Dying to Work’ charter to protect my employees. I will also be encouraging businesses in Hove and Portslade to follow suit and sign up to the TUC’s voluntary charter. Since its launch in April 2016, the TUC’s ‘Dying to Work’ Voluntary Charter now protects over half a million employees in companies such as Santander, Co-Op, Rolls Royce, Weetabix, Royal Mail and E.On. A number of public sector bodies including NHS trusts, police authorities and many local authorities have also signed up alongside trade unions and charities. Under the Equality Act 2010, employees in the UK cannot be dismissed because of their age, disability, race and pregnancy & maternity etc. These are known as ‘protected characteristics’ and the TUC proposes adding terminal illness to the list to prevent discrimination and unfair dismissal. You can read more about the campaign and how to sign your employer up here. Mrs Lucas will say: “Conference, we win when we stand up for what we believe in – from the smallest issues in a local ward, to the biggest issue of the day – Brexit. Let’s not forget that the EU was originally a peace project, forged in the wake of the destruction and devastation of the Second World War. Rising from the rubble left by bombs and armies. The principle that nations who share resources will value peace above war. And the cause of peace is at stake again today. In his leader’s speech, co-leader Jonathan Bartley will criticise Theresa May and Jeremy Corbyn for pursuing a Brexit that will “hit poorest communities hardest,” and call on Labour to stand with Greens for a people’s poll on the final deal. Mrs May said she wanted no tariffs and only one set of regulatory checks for goods (between Europe and the UK.) She repeated an earlier commitment to leave the customs union while avoiding a hard border in Ireland. She wants to limit barriers to movement of labour but to mirror free movement without signing up to it. In response to Theresa May’s speech on Brexit today, Jonathan Bartley will say: “The Green Party will not give up on staying close to Europe. We are proud to be campaigning for people’s poll on the final deal that explicitly includes an option to remain part of the European Union. Because as we march towards the national calamity of Brexit, we know there is an alternative. “But, far from acting like an official opposition, Labour risks being complicit in an unfolding disaster, and one felt first and foremost in those very communities it seeks to represent. Both Jeremy Corbyn and Theresa May are committed to a Brexit that will hit poorest communities hardest. This article was first published in Brighton and Hove News yesterday ahead of the Green Party spring conference. Approximately 70 people turned out to hear about and share ideas for the masterplan – and to learn more about a masterplan for the surrounding area – to include hundreds of new homes as well business units. The masterplan aims to ensure that the regeneration is coordinated, not piecemeal. This will mean improving connectivity around the station and actively considering the design of public spaces, community facilities, community hubs, conservation and transport. It will form part of Neighbourhood Plan Part One which is a statutory document subject to inspection by a planning inspector and a referendum. Look out for the Hove Station Area Improvement Group which is a subgroup of the Forum that will be meeting in March. If you want to get involved, email Hove Station Neighbourhood Forum for details. Several residents raised the issue of school places. Liz Hobden, Head of city planning at Brighton Council, announced that they are introducing a community infrastructure levy (CIL) which will be a tariff for strategic infrastructure such as schools and roads. She explained the new tax will sit alongside developer contributions (section 106) but it will not be tied to a particular development. The Forum will be able to access a percentage of this money for local projects. Alan Gillam raised concerns about the impact of development on local businesses, some of whom have been forced to close. Ms Hobden acknowledged the need to protect industrial spaces but she said the area is changing and there will be a displacement effect on businesses and people who work there. Others expressed concern about the density of housing but Carrie Hynds, Lib Dem parliamentary candidate for Hove, thought the industrial area on Conway St west of the station was an ideal place for high rise housing. She said the new homes must be affordable to local people, if they are unaffordable, they will make the housing crisis worse. Ms Hobden said the council was trying to bring rents down in line with the local housing allowance which is 70% of market rates. Councillor Jackie O’Quinn said the government needs to stop the right to buy of council housing and reduce the discounts. This article was also published by Brighton and Hove News. Voice of Islam found a blog I wrote in 2014 about Nigel Farage: foe not friend and invited me to do a live radio interview. I believe that Mr Farage has appealed to prejudice and xenophobia and is responsible, with David Cameron, for Brexit. Mr Cameron couldn’t get his own house in order and Mr Farage said: “Take back control of our borders” which means retreat from the multiculturalism that makes Britain great and become Little England. It means less regulation, US monopolies dominating our markets, the British government having no legal defence i.e. TTIP, trading with nations regardless of their human rights record and less environmental protection. I would far rather befriend Angela Merkel than Donald Trump. Unfortunately, Prime Minister Theresa May does not agree. The media in some way is complicit in painting a rosy picture of Nigel Farage as a self-made man prepared to stand up for Britain. He is provocative but smooth which makes for good television. Part of the appeal of Mr Farage and Donald Trump is that they speak their mind and do not spin their message to what they think electors want to hear. However, they divide, exploit and can stir up prejudice and resentment, against immigrants, for example (cue the poster.) Mr Farage used to work buying and selling commodities in the city. He pretends to be “everyman,” which is disingenuous, and he likes a pint. He may like a pint but he is not everyman. There is a lie at the heart of Farage’s politics, he says he is sticking up for ordinary people against the establishment. Would he do so if he really was living on the breadline? Very little attention is paid to the fact he is a wealthy self-made man pitching for popularity. Political parties need to attack Mr Farage on his policies. (Mr Trump spared no punches when debating with Hillary Clinton in the US election.) For a long time, UKIP has been regarded as an eccentric side-kick. After the European elections in 2014, they were taken more seriously by the media but their policies have not been debated with the rigour of the other parties. UKIP’s appeal is insidious, appealing to the heart not the head. It should be tested by the heart, with cool logic and a forensic eye. One Parliamentary Candidate who failed 7 times to become an MP, should not get so much media attention. At the moment, the EU are investigating whether UKIP misspent £400,000 of taxpayers in the EU to fund its electioneering in addition to the Conservative accounting fraud. The European Parliament has separately reported that funding meant for EU business was being diverted into funding UKIP in the UK and the UK referendum campaign. The Independent ran this article yesterday. Mr Farage said in their defence: “Every single eurosceptic party and group is wilfully being victimised by a system that really reminds me of the Soviet inquisitors.” I reported UKIP expenses under investigation in my 2014 blog. Their expenditure should be transparent and without the EU, we wouldn’t even know. This goes to the heart of my mistrust of Nigel Farage. Like Donald Trump his appeal is that he presents as anti-establishment. Mr Farage does not have a road map or he would have been elected by now, he has failed 7 times to become a Westminster MP but has hinted he may stand again… or he may be better received in America. It is interesting that Mr Farage stood down as leader after the EU referendum victory and it has become clear that the “Brexiteers” have no plan. They all jumped ship leaving Theresa May, a “remainer,” to take up the poisoned chalice of negotiating withdrawal from the EU. Shame on them, they would rather bully her than lead. I am the first speaker on a live drive time programme considering the impact of faith leader Caliph Hazrat Mirza Masroor Ahmad who is leader of the Ahmadiyya Muslims. The Evening Standard has identified him as the most inspirational faith leader in London in 2017 after the Queen and I try to explain why. The Caliph had a very strong message for terrorists and any other extremists that love of your country is part of your faith. He said integration was about being an asset to your country, it was not about the hijab or alcohol. At the Jalsa Salana which is the community’s annual convention, the Caliph told delegates that Islam is the guarantee of security in the world. Without exception, without any discrimination, all of the people are equal. It’s when people think they are superior, that they disturb the peace. At the annual Peace Symposium last March the Caliph said the arms trade was a very clear example of how business interests and wealth take priority over peace. He said the arms trade fuels warfare and has trapped the world in a perpetual cycle of violence. Last year the peace prize was given to Ms. Setsuko Thurlow because of her lifelong campaign for nuclear disarmament. This extract was broadcast live on Voice of Islam radio channel on Monday 23 October and you can listen to the full podcast below. Singer and actor David Essex is the virtual star of a family pantomime playing in Brighton over Christmas this year. The 1970s pop star will appear on an LED video wall as Baron Hardup in Cinderella at the Hilton Brighton Metropole from Friday 22 December to Wednesday 27 December. And he will be joined by a string of West End performers including Joseph Peters and Alasdair Buchan. The cast also includes a number of Brighton personalities. They include David Hill as one of the ugly sisters, Lou Nash and Alex Baker from Juice 107.2 and Dean Kilford from Latest TV and BBC Sussex playing Buttons. Keris Lea will play the Fairy Godmother. Cinderella is the brainchild of Mr Hill who “fell into” pantomime in 2001 while sharing a flat with the comedian and novelist Julian Clary. He said that his travel business was in difficulty after the 9/11 terror attack because people were afraid to fly. Mr Clary suggested that he audition and Mr Hill found a second career as a pantomime dame. A countywide search for Cinders was mounted a month ago resulting in 300 applicants. The show’s writer and co-producer Tim Newman said: “Hannah Bailey, who will be playing Cinderella, offers us everything we were hoping for in this part and I know that every young girl in the audience will fall in love with her. 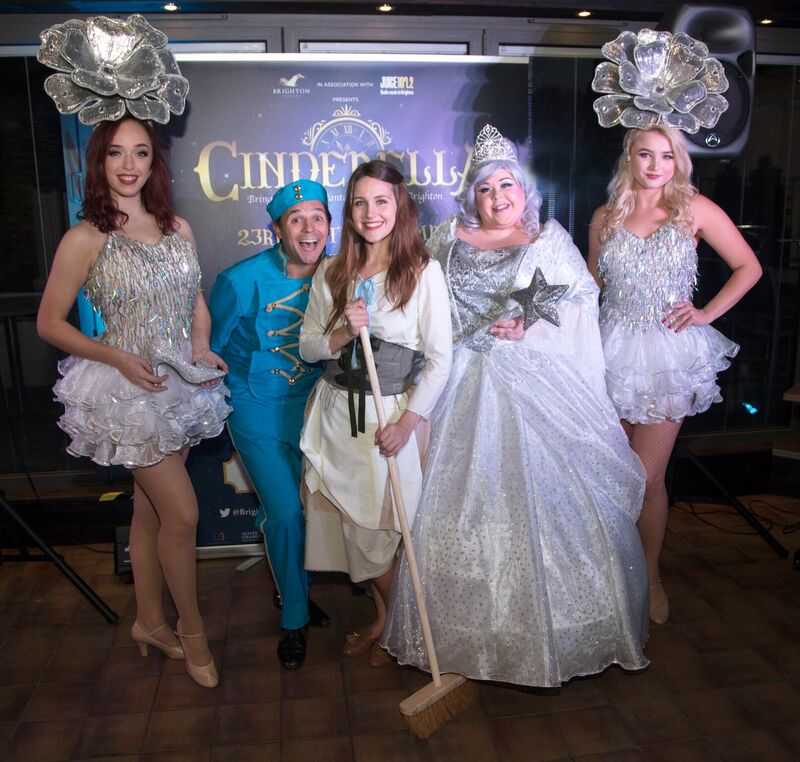 Cinderella is being produced by Brighton Premiere which is a collaboration of event company E3 and the Brighton Academy of Performing Arts. The show will be directed by Mr Newman and Stuart Dawes from the academy. Ticket holders will enjoy free entry to a Christmas Fayre with food, dodgems, face painting, charity stalls and a chance to meet Santa. Each performance will raise money for the three biggest children’s charities in Sussex – the Chailey Heritage Foundation, Chestnut Tree House and Rockinghorse. Juice 107.2 is the pantomime’s headline sponsor. Others include Sussex Life, Visit Brighton, Hilton Brighton Metropole, Oliver and Graimes, Donatello, City Cabs, Glencairn Consulting, E3, Brighton Academy and McKenzie Associates. Cinderella will run twice daily from Friday 22 December until Wednesday 27 December with no shows on Christmas Day. Tickets cost from £10 (restricted view) to £22.50 (premiere) and are available online at brightonfamilypanto.com. This article was first published in Brighton and Hove News on 19 October.